Memory Lapse – Star Trek MacBook the next generation is here. I watched it launch live on the 2012 WWDC keynote (on twit.tv) and I ordered the £1,799 machine the next day. 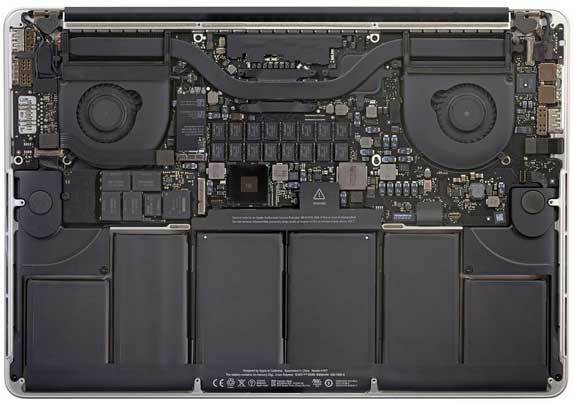 I assumed I could upgrade the RAM at a later date but a day later, the iFixIt tear down revealed that, as with the Airs, Apple has soldered the memory directly to the logic board. While 8GB is a lot, it turns out this would be my one and only chance to max out the machine that’s probably going to be my daily companion for another three years. So after 4 days of tortured deliberation I changed my spec to the maximum 16GB of 1600MHz DDR3L SDRAM. An additional £160, which while still way too expensive, isn’t as high as the stratospheric Apple memory upgrade prices of recent years. My trusty 13″ was upgraded with a 128GB SSD AND a 1TB spindle last year and it’s been fantastic to be able to carry my entire music collection and LightRoom library with me everywhere I go. I’m hoping that a year from now there will be some affordable 3rd party upgrades for the stock SSD, as happened with the MacBook Airs. Perhaps in two years time there might even be a 1TB SSD that won’t be the price of a small family hatchback!? In the meantime I’ve ordered an external 2.5″ USB 3 Freecom Mg 1.5TB drive. This ups my total on-the-road capacity from my current set-up of 1.12TB to 1.75TB, but with a definite reduction in convenience, having to carry the external drive when I need it. The Need for Speed – The Ivy Bridge 2.3GHz Quad-Core i7 processor (model 3615QM) is state of the art and uses Intel’s new 3D transistor design. These 22nm chips run cooler and use even less power than the previous generation Sandy Bridge CPUs and can dynamically over-clock themselves to 3.3GHz with “Turbo Boost” when required. 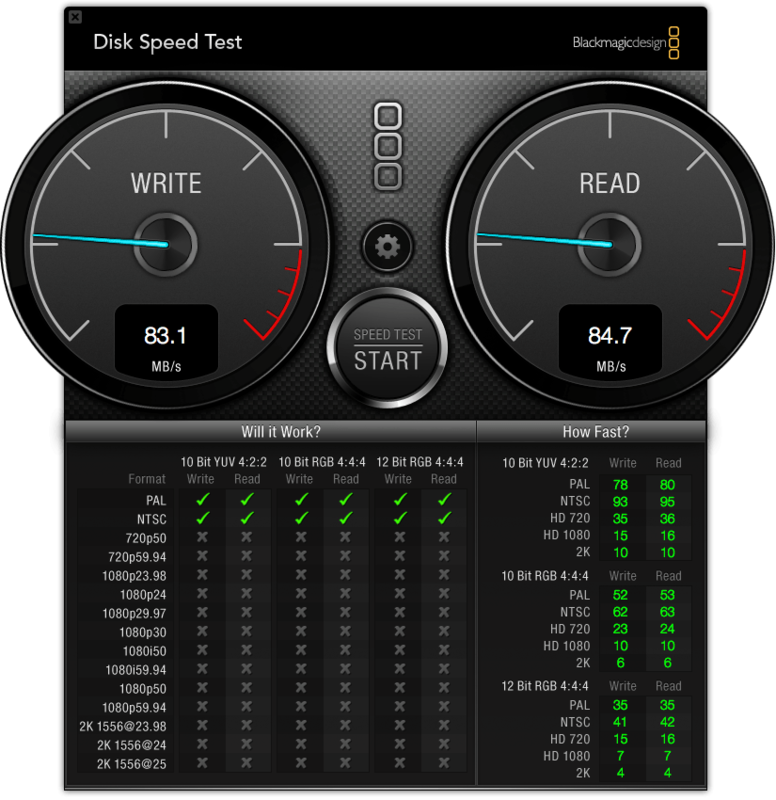 Each of the four cores of the i7 supports hyper-threading making it appear as an 8 processor machine. Amazing in a desktop, truly spectacular in a laptop (check out some of the real-world performance benefits below). You Win Some, You Lose Some – I can easily accept that there’s no longer a built-in Ethernet port on this machine, it’s something I used maybe a dozen times a year when doing full backups of my hard drive and it’s easily put back using the Thunderbolt to Gigabit Ethernet Adapter. What I can’t understand is why Apple thinks it’s OK not to throw one of the £25 adapters in on its top-of-the-line “Pro” laptop range. Ethernet is the planets ubiquitous standard for networking and it’s incredibly mean not to include one in the box of a machine that costs close to £2,000! A similar FireWire adapter is also due if you need it and there’s a £9 MagSafe to MagSafe 2 Converter so you can re-use your old adaptors on the new machine’s thinner, wider power connector. I’ve found the new plug is a little too easy to knock off the laptop. It’s fine on a desk but seems to detach with the slightest touch when it’s on your knee. The green battery level check LEDs have gone from the side of the machine as has the Kensington Lock slot, white sleep LED and IR remote receiver. Perhaps Cupertino assumes you have an iPhone to use as an IP remote these days, (or maybe there’s a Bluetooth remote in the works?). The old analogue microphone port is gone too, although this is something I’ve literally never used (my headset is USB). The dual purpose analogue headphone jack and digital optical line out port remains. The lack of an optical drive is of course another big reason for the new thinner design. I’ve not had a built in DVD drive in my current machine for nearly a year and I’ve not missed it. The age of physical media is certainly over for me as the optical drive has followed the floppy and the dodo, but that may not suit everyone. If your use case is different then you can of course get an inexpensive external optical drive (I use one of these) or stick with the non-retina MBP’s while they still carry them. Something I’m happy to lose with this new design is size and weight. The new form factor is somewhere between the Air / Ultrabooks and a regular sized laptop. Surprisingly at 2.02 Kgs this 15″ is actually fractionally lighter than my 13″ and its 25% reduction in height (now 1.8 cms) makes it about as thick in total as the previous design minus its lid. It’s also very slightly narrower than the old 15″ model at 35.89 cms (by 24.71 cms deep). Other upgrades include a new 720p FaceTime HD camera, Bluetooth 4.0 and an all new speaker design. I’ve read that low frequencies are driven out of the slots along the bottom of the case, although to be frank there aren’t any low frequencies here. Don’t get me wrong, the speakers are the best I’ve ever had on a laptop, but if, like us, you are a fan of analogue synthesisers they are still going to disappoint. The new thermal system, complete with the now infamous asymmetric fan blades and aforementioned slots along the sides of the chassis, makes this thing run cooler and quieter than ever before and the 95-watt-hour lithium-polymer battery represents a 22.5% increase over the previous 15″ model (but more on that later). Bringing over some know-how from the iPhone, the new dual microphones, along with Mountain Lion’s new Dictation feature, will apparently “create an adaptive audio beam” that helps to separate out your voice from background noise. Super duper. The built-in SDXC slot means I can finally do away with the need to attach a USB doohickey to import my photos into Lightroom. Checkout the Nifty MiniDrive, a Kickstarter project designed to use the slot as additional storage or backup with a flush mount MicroSD card adaptor. The Intel HM77 chipset brings support for USB3 and the machine has a socket on each side now, much handier than trying to squeeze a large USB thumb drive that’s tight beside a port that’s already occupied. I noticed in the second week of ownership there’s also a slight downside to this too though. If you have one of the older external 2.5″ drive caddies that require 2 USB ports to power the drive you are going to need a USB extension lead to make it work. My new USB 3 drive only requires one USB port to work though thankfully. Both ports are backwards compatible with USB2. The other addition I’m going to get great use out of is the full size HDMI socket. No more faffing about with adaptors when attaching my MacBook to the TV (go Plex). The Wi-Fi is 802.11n flavoured (no 802.11ac yet). The excellent backlit keyboard has ever so slightly less travel than my previous machine but is still great. The peer-less glass multi-touch trackpad is as before. Mountain Lion is a free upgrade if your early adopter shipped with Lion and it brings several new features that this updated hardware takes advantage of such as PowerNap. But of course I’m teasing you, the new component you really want to know about is the screen – right? Eyeballs Two Point, Oh My! 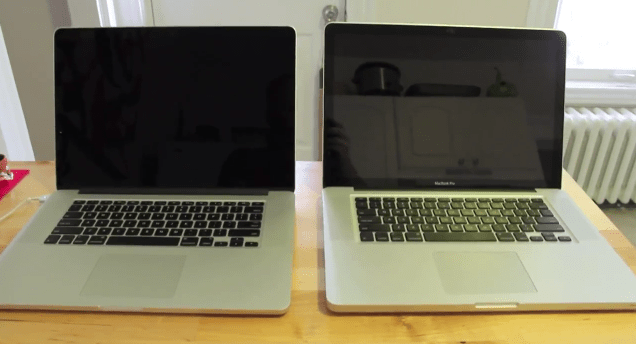 – The 13″ MacBook has a resolution of 1280 x 800, a smidgen over 1 million pixels. Our 50″ full HD telly has around 2 million. 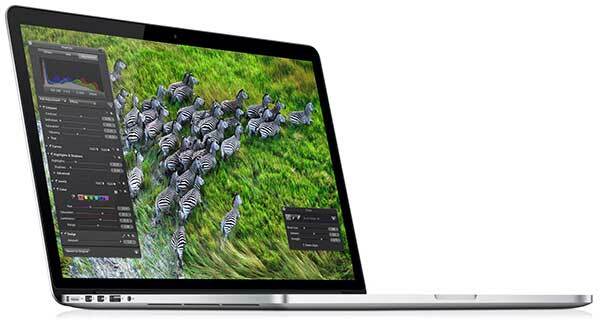 This new MacBook has an incredible 5.1 Million pixels on it’s 2880 x 1800 15.4″ LED backlit panel. This is the worlds first 220 pixels per inch laptop display and that gains it Apple’s ‘Retina’ title. To understand how all this works you’ve got to get your mind round the fact that it’s a new era and Pixels and Points are not the same. No longer do more pixels necessarily mean smaller UI elements. Yes, they can, but the benefits are being used here to increase the definition, rather than increase the workspace. The machines default ‘best for retina’ setting uses pixel doubling (4 new pixels for every old one) so the the 2880 x 1800 panel appears as 1400 x 900. Here’s the display preferences panel showing “Best for Retina display” currently selected. The mouse is hovering over the right hand option and on the left it shows “Looks like 1920 x 1200”. Of course if you’d rather use the extra pixels for more work space then the OS offers several scaled resolutions so you can do that too. The full range of options are 1920 x 1200, 1680 x 1050, 1280 x 800, and 1024 x 640 pixels. Res switching is fast and smooth and choosing one of the scaled options doesn’t result in the fussy-non-native-res output you might be used to on a Windows PC though, rather a crisp display only slightly less-sharp than full retina. Check out the VM screenshots below for some examples. There are several 3rd party ways to set the Retina display to its native 2880 x 1800 as Apple hasn’t included this as an option. Once you do it though you’ll see why they haven’t. The OS elements become so tiny they are all but unusable (unless you’re a teenager with perfect eyesight). Some games do already support the native resolution of the panel and other apps can intelligently choose. 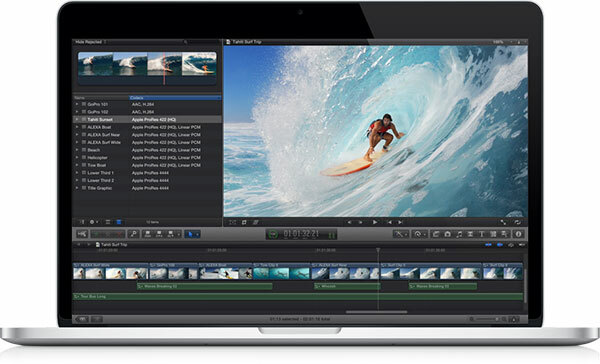 For example in this screen shot of Final Cut Pro X The Surfer Preview is in full pixel for pixel 1080p, whilst the UI elements are scaled above 1:1. Other advantages of the new display over and above its pixel density and resolution are a reported 29% increase in contrast ratio. Its IPS technology means a much wider (178 degree quoted) viewing angle – one of the worst things about the old MB screen was the narrow field of view. This was especially noticeable with a dark low contrast area, like the Sonos App where the screen would need to be tilted to reveal the detail in say the top of the panel, which would then mean losing it at the bottom. The new display is a huge improvement in this area. I’ve never been one of the people who was particularly bothered by the reflections of the glossy display but Apple say that glare has been reduced “by up to 75%”. A new method of building the screen into the lid means no extra layer of glass on top and it really does bring a significant reduction in reflections, see the comparison photo. The machine has Intel’s HD 4000 integrated graphics which by all accounts are a good improvement over the previous generation. However it’s the ability to automatically switch over to the discrete NVIDIA GeForce GT 650M Kepler GPU with its 1GB of GDDR5 memory that really powers this beast of a display. This set-up is even a passable gaming rig if that’s your thing. If you’re a multiple monitor kinda guy (or gal) then the hardware simultaneously supports full native resolution on its built-in display plus up to 2560 by 1600 pixels on up to two external displays too via the Thunderbolt ports PLUS a fourth monitor on the HDMI port! As with the iPhone and iPad Retina displays it’s the sharpness of text that hits you most. But it’s even more impressive on a 15″ display than on one of Cupertino’s iOS devices. Apple has updated most of its own software Mail, Safari, Calendar, iMovie, Final Cut Pro X, iPhoto, Aperture etc and they announced retina versions of Adobe applications are in the works too. But clearly it’s going to take time for the rest of the apps and indeed the web to catch up. And that’s one of the biggest negatives here. 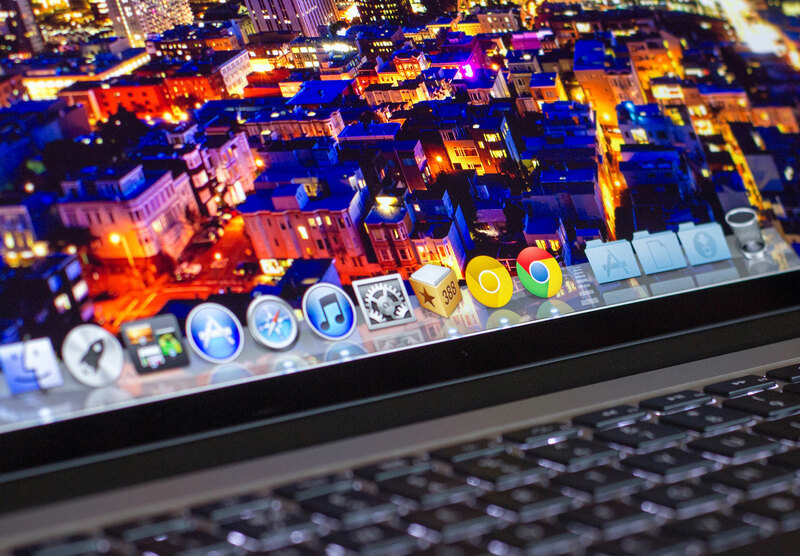 You might think you don’t need a retina display – and it’s best you don’t use one because it’s hard to go back. Once you’ve seen retina’s beauty, you can’t ever un-see it. When you come across non-retina elements, the website suddenly looks fuzzy, some elements are doubled and merely look soft, while other are downright ugly and jarring. Going back to the old screen on the 13″ is a similar experience. Real World Comparisons – There were three main areas I wanted to improve with this upgrade. 1. More screen real estate. Probably my biggest single issue with the 13″ MacBook was its resolution. Working in LightRoom, Photoshop, iMovie etc was always a cramped experience and even before the retina announcement I had decided to make the move to a 15″. The new machine is just what the doctor ordered and the extra work area is a revelation. Here are a couple of screen shots of an extreme example to demonstrate running FOUR virtual machines – OS X, Windows XP, Ubuntu Linux and Chrome OS, (note there’s still around 4.5GB of RAM free while running these 4 VMs). These are using the extremely useful scaled res of 1920 x 1200 and the crazy native res of 2880 x 1800. 2. More speed – I guess most of us are power crazed when it comes to computers. The top complaint I always hear from friends and family is ‘my computer is so slow’. We all expect the next gen machines to bring a significant performance boost and as this is a multiple-generation upgrade from my 2.4Ghz Core 2 Duo big things were expected. Big things were delivered such as cold boot to login screen in under 16 seconds and a 2 second launch time for PhotoShop CS5. 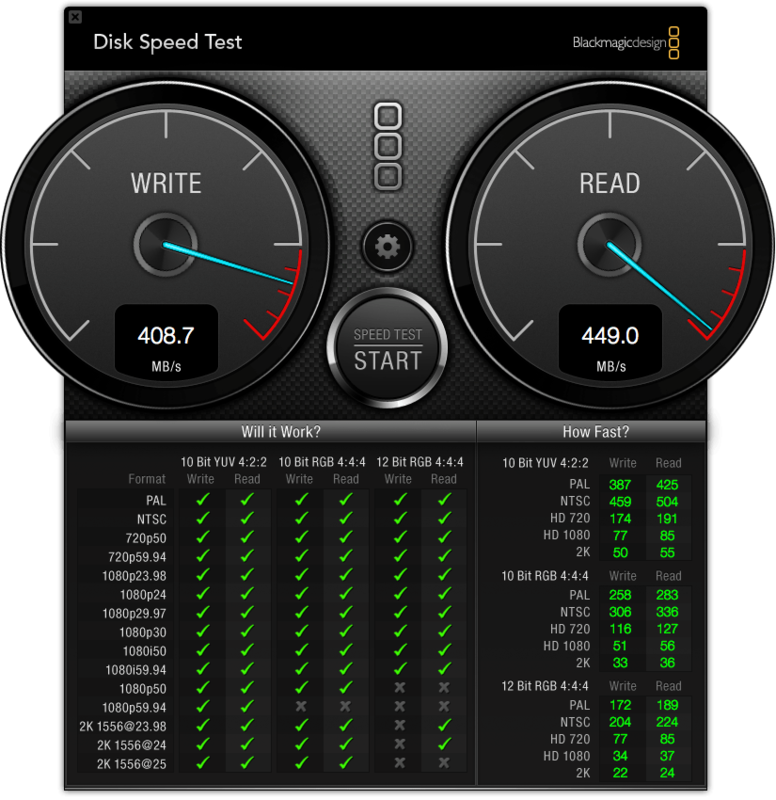 Here are some other real world examples (and remember this is comparing to a ‘pimped’ 13″ MacBook with 8GB RAM and an SSD)…. 3. Better battery life – The 13″ struggles to get more than 2.5 hours of real world use on its removable battery. Apple says the new machine’s battery is good for “up to 7 hours wireless web”. So with all that in mind the Automated Home Unscientific Battery Tests ranged from 5 hours to just over 7.5 depending on how we used it. That’s a minimum of a 100% increase in off grid use for me and more like 200% if we’re not hammering it. I’d consider myself a fairly extreme use case as the 13″ was in constant daily use, mostly on mains during business hours, and on battery in the evenings. 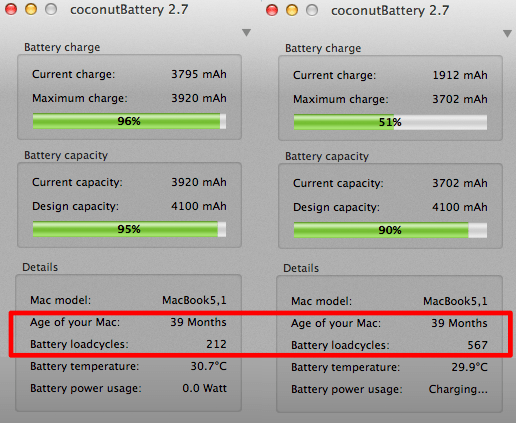 A quick check with coconutBattery shows that In the 39 months I’ve owned the 13″ I have 779 cycles across my 2 batteries. That comes out at almost exactly 20 full cycles per month so 1,000 charges extrapolates out at just over 4 years – and that’s ignoring the fact that I should need fewer cycles per month due to a much improved battery life. This all points to Apples ‘up to 5 years‘ as being attainable. It may be that it’s the 2nd or 3rd owners of these laptops who will be faced with the £159 battery replacement. Either that or risk bodily harm trying to un-glue the old cells from the case and install the inevitable 3rd party kits. Summing Up – Apples laptops could never be considered ‘cheap’, but even for a Mac this is one expensive machine. However it’s not aimed at the mass market, far from it. Only you’ll know if it makes sense to go pro in your own situation. As with most things in tech, the Retina display will filter down, so merely waiting will bring it to the rest of the Apple line-up in time. As for now though, the combination of incredible performance, a new svelte form factor and that world leading screen makes this the new best computer I’ve ever owned, and by a huge margin. 1 Comment on "MacBook Pro with Retina Display Review"
Great review, Mark! I want one.